One of the strongest contenders in pickup segment is certainly VW’s Amarok model. It has been present in the similar form since its introduction in 2010 model year and after all its main rivals presented their improved versions, VW is forced to answer in similar manner. The answer will come in form of the facelifted 2017 VW Amarok which has to offer smaller or greater upgrades on all fronts. No doubt, the biggest change is new V-6 turbo diesel engine which makes this model the sole pickup truck that is powered with V-6 displacement. New engine is compliant with Euro6 standards and in top-spec version it overtops the main rivals in both power and torque. It also brings 500kg improvements in towing ability over the current model and with it is now in line with top rival models. The model will also promote some exterior changes and interior will be upgraded as well. It will also offer three drivetrain options including two-wheel and selectable or permanent four-wheel drive configurations. When we are speaking about the changes the most significant for 2017 model year will be brought for the engine department. There, VW will actually go with engine upsizing and instead of so far exploited 2.0 liter inline-four turbo diesels, the new 2017 VW Amarok will benefit from a 3.0 liter V-6 turbo diesel engines. This actually means, that Amarok in this position will be in front of its main rivals in terms of engine power and size. Its closest rivals in terms of engine power are Ford Ranger and Mazda BT-50 with 3.2 liter five-cylinder engine and Holden’s Colorado with its 2.8 liter four banger. However, the new Amarok top-spec model will produce 165 kW (221 hp) and torque of 550 Nm. As reference, the top performer of the current version is capable for 132 kW and 420 Nm while rivals have been beaten with Holden model which maxes 500Nm while mentioned Ranger and BT-50 deliver 147 kW and 420Nm in their top configurations. Speaking about top V-6 version it reaches peak torque at just 1,500 rpm. So, engine will be capable to deliver effortless power and acceleration in both on- and off-road drive and will be coupled with either six speed manual or eight speed automatic gearbox which all together are said to return lower noise levels and lower emissions. VW also claims that automatic-speed geared models will return 7.6 liters per 100 km and will be capable to reach 62 mph in 7.9 seconds. Another important numbers for trucks are towing ratings and VW also promises up to 3.5 tons of towing capability which bring this model inline with class leading models. It is also important to say that new engine is shared by other models like Audi Q7 and VW Touareg although it is tuned for truck duties. Aside from the top 165 kW version, this engine will also be available with two more power outputs including 120 kW and 150 kW. On the other hand, Amarok will come in three drive configurations. The entry model will feature rear-wheel drive with six-speed manual transmission. The next configuration will include manual gearbox and selectable 4Motion four-wheel drive system while the most capable driveline will use permanent 4Motion all-wheel drive with automatic shifter and Torsen differential. All this however means that new Amarok gets even closer to large SUVs in terms of drive feel and we should expect more refined ride than on the outgoing model. In the same context, the new model will also get upgraded steering system which transfers to electronically-controlled Servotronic unit and will bring more precise and responsive feel. Top-spec version will also include larger brakes and 17-inch units will be installed upfront while rear wheels will feature 16-inch disk brakes. The new engine and improved drivelines will be followed with mild exterior changes and interior side will present more substantial updates compared to outer look. As for its look, cosmetic changes bring this model inline with brand’s latest models. The changes will be seen in the front fascia where model receives slightly redesigned bumper and grille as well as headlights. The rear side will experience the same treatment with reworked bumper and taillights. 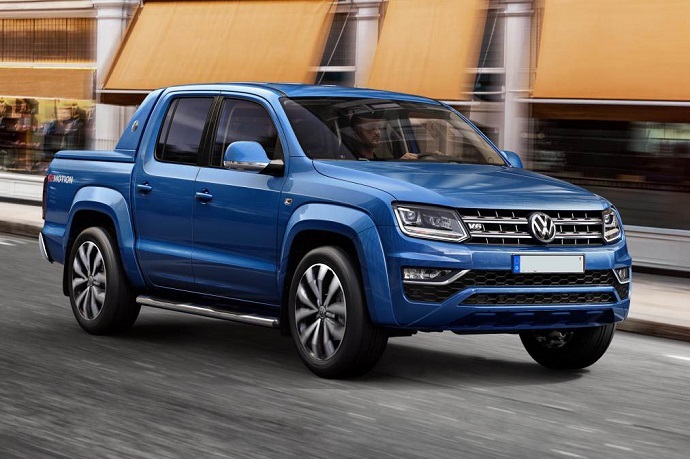 In terms of styling, new Amarok will also bring new wheel design and overall its look is cleaner and slightly toned-down which means it is not as rugged-looking as the version it replaces. On the other hand, interior is also said to be improved and better equipped. The material quality and finishes are excellent and dashboard features new design. Design is, to say, more angular and recalls on design which is found in the VW’s passenger vehicles. Air-vents aren’t circular anymore and HVAC controls are restyled. The position of the center screen is also pushed up. The model also offers new adjustable seats and steering wheel which will provide good driving position and improved comfort. The model will also include the latest infotainment interface which features voice commands, navigation and modern integration and connectivity options. The new 2017 VW Amarok will be available as dual cab only but company hasn’t reviled its trim options and included equipment. However, the similar strategy is expected as with the current model’s Startline, Trendline and Highline trims. We will be able to configure our model with features like be-xenon headlights with LED running lights, 20-inch wheels, Led illuminated side sills, sports bar, etc. Inside some models will be available with 7-inch screen based infotainment system, 14-way power adjustable driver’s and passenger’s seat, leather upholstery, etc. It will also include more equipment than that is found on the current versions including safety features and other convenience. With new punchy V-6 engine, improved driveline, refreshed exterior and improved interior and equipment, the new 2017 VW Amarok certainly imposes itself as the top end choice in its mid-size pickup class. Considering, it doesn’t offer two-door cab model, VW obviously targets premium truck buyers which prefer its commercial credentials. As for its launch date, the model will go on sale in September and VW confirmed it won’t be available in US. The price hasn’t also been specified but we should expect base variants to be valued at around 26.000 euros while top-spec versions will reach 46.500 euros.